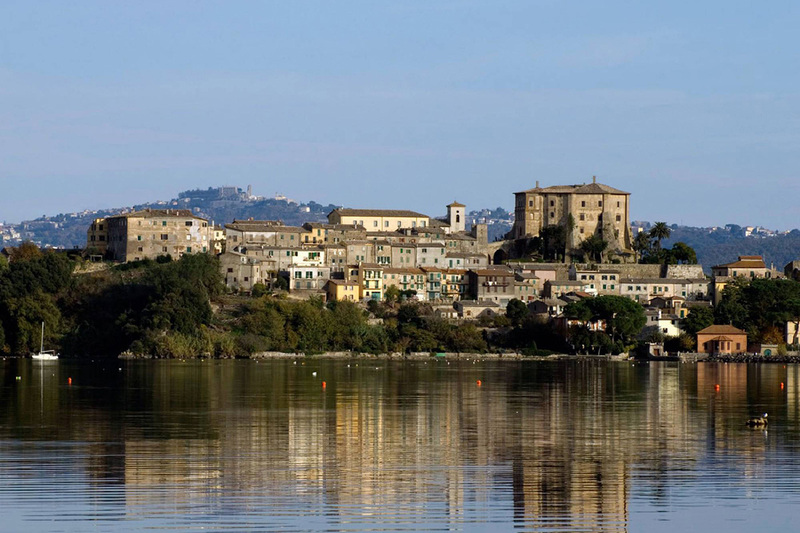 Marta, the main and active port of Lake Bolsena, is a characteristic fishing village. It rises to m 314 s.l.m. on the southern shore of the largest volcanic lake in Italy, 23 km NW from the capital Viterbo. The visitor offers a discreet medieval village with alleys and squares, perched around the Clock Tower, a quiet lakefront shaded by plane trees, ideal for relaxing walks, a long beach and a small harbor that shelters small boats as well as the characteristic fishing boats .It is known for its excellent cuisine, the DOC Cannaiola wine and for the “Barabbata”, a beautiful and evocative popular festival. A whole that makes Marta a pleasant place to discover and visit. The origin of this village, in the absence of established evidence, is controversial. According to tradition it derives from an ancient Etruscan settlement, according to other theses its name derives from the Phoenician Marath. The first millennium lacunoso of history tells us the tragic story of 534 AD, which has as its protagonist the queen of the Ostrogoths Amalasunta, daughter of Theodoric, segregated and killed on the Martana Island. The established history of the country begins instead in 726 d.C. when his name appears for the first time in an act of donation for the constitution of the “Patrimony of S. Pietro in Tuscia”. In the 13th century the Rocca was built by Pope Urban IV, built according to legend, with the remains of the ancient Bisenzio, of which only the octagonal Tower, today symbol of Marta, remains. In the early Middle Ages it was fiercely contested between the Church and the Lords; was subjected to the Prefects of Vico, the Lords of Bisenzio, Angelo Tartaglia, the Orsini and finally from 1537 to the Duchy of Castro, ruled by the Farnese until their decline, which occurred with the destruction of Castro in 1649. Following this event, Marta he returned to the dominion of the Church which maintained it until the Unification of Italy. The city of Montefiascone is located on the Volsino crater belt, between the Bolsena lake and the Cassia state road, at an altitude of 640 m. From this privileged position there is a vision of an incomparable landscape that goes from the Tyrrhenian Sea to the Maremma, to the lake with its beautiful islands Martana and Bisentina, the latter famous because it houses in addition to the Farnese tombs, also several works by Antonio da Sangallo Giovane and Vignola. For this position Montefiascone is characterized, from the beginning, both as an important strategic place for political and religious reasons. The Etruscans considered it a sacred area, perhaps the seat of the legendary Fanum Voltumnae. The main testimonies of the Roman period are the conspicuous and in good condition of the consular Cassia. 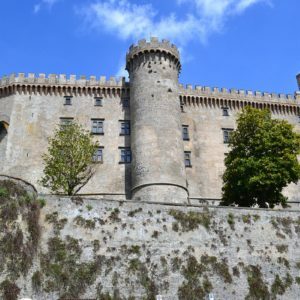 The story is linked to some popes, including Urban V, considered the greatest benefactor of Montefiascone: to him we owe the radical transformation of the fortress to accommodate the papal court and the title of diocese. Honors also to Pius IX, to whom the inhabitants of the place, on the occasion of his visit in September 1857, dedicated the construction of a door (Porta Pia). The two plagues of 1527 and 1657, together with a ruinous earthquake in 1695, marked the decline of Montefiascone as a papal residence: the Fortress was abandoned and used as a quarry of material. The lake of Bolsena, in the province of Viterbo, in Lazio, is the fifth largest lake in Italy, in the caldera of the Vulsinio volcanic complex, but it is the largest lake basin in Lazio. It lies in an environment of great beauty, a land of tufa, of ancient craters like the one that welcomes it and of dark rocks that form the cliffs on which emerge villages and castles. The chain of the Volsini mountains crown the lake, between slopes planted with vines and olive trees, woods, archaeological memories (the Tuscia was the heart of the Etruscan civilization), historical centers of great interest. 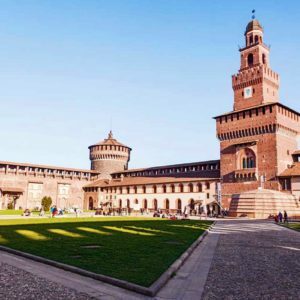 Our full day tour will give you the opportunity to discover a corner of Italy out of the touristic routes beaten by the mass tourism. Interesting historical monuments to visit, in addition to the aforementioned Clock Tower, are: the Renaissance palace of the Farnesian period that stands next to the town and especially the Romanesque Sanctuary of the Madonna del Monte, renovated at the end of the fifteenth century, erected on top of a panoramic hill, not far from the historic center. This holy place for the martans is also important because it represents the fulcrum of the traditional and extraordinary Barbaudata festival. The economy of Marta, in the absence of industries, is mainly based on agriculture, fishing and trade in fish. Among the crops, the vine and the olive tree predominate, which are well suited to the volcanic nature of the soil. In unfortunately limited quantities, it produces an excellent dessert red wine the DOC Cannaiola, while there are no problems for the white “Est! East! Est! “, The pride of the entire Lake area. From the olive trees the local mills derive an equally sought after and excellent extra virgin olive oil. The many restaurateurs of the area, fed by local fishermen, offer numerous dishes based on fresh fish from the lake, but also from the sea, as Marta is a very important center for trade and sorting of fish products. 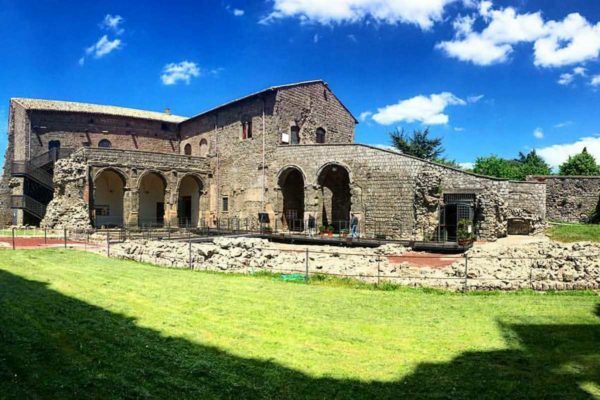 The historic center of Montefiascone holds important testimonies of its past. This begins with places of worship including the Church of San Flaviano consisting of a particular facade, where three Gothic arches stand out. In the central one there is the portal of access to the grandiose church. This first order is surmounted by a Renaissance loggia, supported by a colonnade. The frescoes preserved inside the church are evocative: some from the Roman and Tuscan schools date back to the 14th century, while others from the Umbrian school date back to the 15th century. Also we find both the Chair of Urban IV and the tomb of Johannes Defuk, central character of the Eastern legend! East!! East!!. 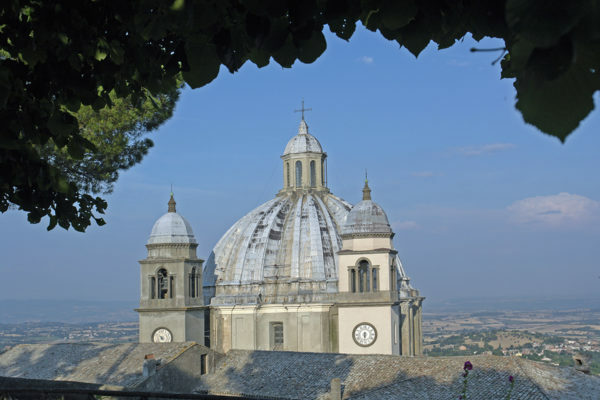 Mighty symbol of Montefiascone, together with the fortress, and marked by dramatic events, is the Cathedral of Santa Margherita that is shown in all its majesty to the visitor, thanks to its large dome. The church was built in honor of a young girl born in the land of Antioch, who lived for the Christian faith and died for her. His remains came after a long and fortunate journey on the Faliscan Hill. The construction of the church began in the fifteenth century by the will of Alessandro Farnese, future Pope Paul III, and took part in artists such as Bramante and Antonio Sangallo the Younger. The construction suffered heavy delays, first because of the wars and pestilences then for a vast fire in 1670 that destroyed it irreparably. It was thanks to Cardinal Albertone Altieri that the entire structure was rebuilt again in 4 years, showing itself more grandiose for the presence of the dome. 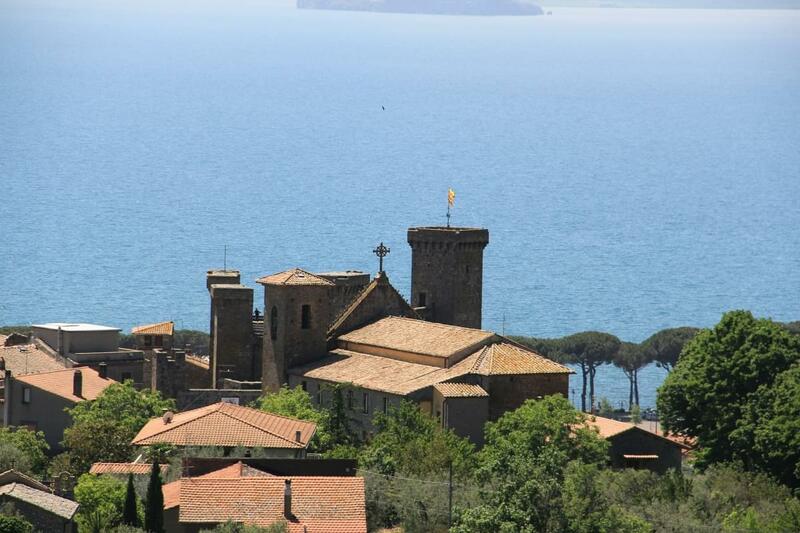 Despite being damaged over time, the Rocca di Montefiascone or Rocca dei Papi, still maintains its majesty and makes us realize the idea of its historical importance that it had in the past. The fortress was built during the 12th century, at the time of Innocent III. Its history is linked to the events of various popes when the invasions by the Normans and Saracens were frequent and many of the popes were forced to flee from Rome. So they created the conditions to build the fortress, with high defensive walls, inside which the inhabitants of the countryside also poured out. The almost constant presence of numerous ecclesiastical figures made Montefiascone their preferred destination, as long as the village was not transformed into an Episcopal See. 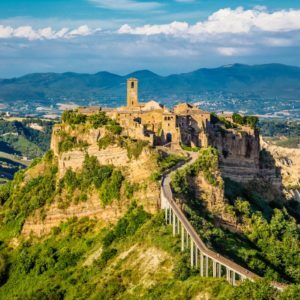 Today only a part of the fortress is visible, but in spite of everything it remains one of the most evocative and visited places in Montefiascone.